Apple has just unveiled the rumored iPad Pro: a gigantic tablet with a 12.9-inch display and full support for the multi-tasking split-screen functionality that come with iOS 9. And it really looks like a big iPad, with the same design style and typical Apple look. The brains of the new iPad Pro is the Apple A9X system chip. This is Apple's third-gen 64-bit chip with double the memory bandwidth, 2x faster storage, and it is 1.8x faster than A8X. That makes the chip faster than 80% of the portable PCs shipped recently, while in terms of GPU, it is 90% faster than most portable PCs. In practical terms, Apple mentioned that it can handle 3 streams of 4K video edit, truly impressive. A big part of the new iPad Pro is its physical keyboard and that's why Apple is introducing its own keyboard solution specifically designed for the new 12.9" Pro tablet. The new iPad Pro has also got a new magnetic connector on the side called the 'Smart Connector'. This new connector is used to easily connect to the keyboard and provide it with both power and data. The keyboard is sold separately for $169. The creative types will be happy to see that the iPad Pro supports the brand new Apple Pencil (a separate purchase that costs $99). This is a special stylus, though: Apple has bundled in responsive sensors in the tip of Pencil so that it can sense pressure, tilt, and stroke, all contributing to a very comfortable experience for artists. You can also easily plug the Pencil in the Lightning port of the iPad Pro. The iPad Pro is really dedicated to productivity and it shows: after all, it's not that often that you see Apple invite Microsoft to demo its Office for an Apple product. Yet this did happen with the iPad Pro. Microsoft has worked closely with Apple to provide great support for the Office suite - including Word, Excel and PowerPoint. Eric Snowden of Adobe went up on stage to demo the tight integration of Adobe products workflow with the iPad Pro and all the benefits of having an advanced stylus such as the Apple Pencil. The on-stage demo showed how you can use the tip of the Pencil sideways to add more water while drawing, or directly press to add more hue, for instance. The iPad Pro seems to be running a bit late and won't be available in the usual fast schedule for other Apple products - Apple has provided a vague November release date, and this coincides with earlier rumors that have mentioned limited supply even when the new tablet arrives. What a useless piece of utter crap. I thought they will optimize OSx for it but it's full blown iOS 9. But hey sheep will buy it. In short, same boring but oversized iPad. Please show me exciting, Apple. I'll stick with my Ipad mini 3 because it can do what this pro can. nice tab. Wish I'd passed on the Air 2. Will it come with the pencil or will the pencil be $200 by itself? It's gonna be sold separately for $100. WTF Apple?! Yes $100 because it's a revolutionary pencil which can turns into a magical wand if you say Tim Cook 3 times really fast. why iOS? it should be running OS X by now.. iOS is so restrictive. Why a toy should have a complete operating system? And that price. Shouldn't have been surprised. At least they ditched the 16GB model, but should start out with 64GB instead. Eric Snowden of Adobe? I thought he was in Russia. Oh, wait, that's Edward. Of course Microsoft helped with the development of the productivity suite. This is not competition to the Surface Pro series in any way, shape or form. 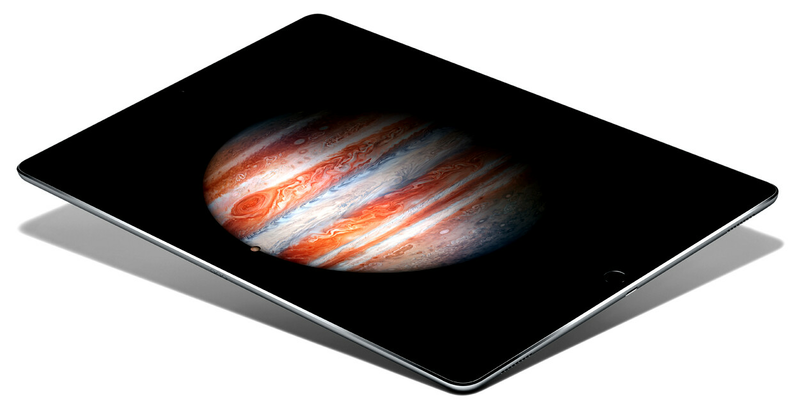 Looking at taht iPad Pro presentation, its sad sad day fo technology - th SteveJobs Apple is dead. Thecheers Apple 2 got have been silenced for ever! Ad I'm not even talking about : (Steve Jobs) It's like we said on the iPad, if you see a stylus, they blew it. In multitasking, if you see a task manager... they blew it. Users shouldn't ever have to think about it. But only thng they actually said, is that big screen is more wsome than small and faster CPU and GPU are so awsome. Apple Pencil ... it costs extra 99$, can do nice things for peeps but where does it go,just hangs there .... are you serious ... samsung can make in case stylus and Apple calls this revolutionary. Default keyboard is nice, but ...really, after all that time.... Apple iPad is decent ablet nothing more, solid performance, but now where near the "awsome" they keep telling. As a graphic designer, I might give it a try. I like it. A Porsche is a lot more expensive than a Hyundai but they both have air conditioning. Does that sound reasonable? Your SP3 is 10x more functional so it SHOULD be more expensive. I maybe failed to really show how ironic I was with the last line. Im not sure where I have you. Do you think its reasonable to take 949usd for a 12.9" device with 128 GB of storage that runs on iOS when a SP3, core i5, 4GB RAM, 128 GB SSD AND a Surface pen included cost 899usd? Separate purchase for the pen? Meh, I will look for the next Note tablet. This Ipad will be a failure. All it competes against are Android tablets and other Ipads.